Solace is a concept I think about a lot. I think 2017 was an emotional thunderstorm for a lot of people. The idea of finding some way to soothe oneself or, failing that, just distract oneself from whatever pain, fear, or anxiety they are enduring probably feels pretty topical right now. It is topical, but it’s also been a perennial fixation for me for a lot of years. I think about solace in the bad times and the good times as well. I consider myself an optimist, a sentimentalist, and a general lover of life. Somewhere in the deepest recesses of my heart lives a beaming, bounding, insufferably happy-go-lucky Roberto Benigni spirit. I let him pay his rent in cured meats and baguettes, with the understanding that he will only publicly embarrass me on rare occasions. I am anything but a miserablist, but dear God do I give a lot of thought to the idea of needing solace. Not because life is bad or because I am any kind of tortured soul, but simply because life is a lot. Regardless of what your personal, physical, medical, relational, or economic circumstances are, I hold to empathy for anyone who is, or has ever been, alive and breathing on this planet. Because, in all its rapture and agony, existence and consciousness are just an awful lot to experience, process, and bear. And for that reason, the idea of finding some piece of solace, some small comfort, to see you through this thing, be it a masterpiece of art or the world’s most effervescently disposable beach read (and, really, I hope we are all getting a healthy helping of both, and everything in between) strikes a huge chord with me. Very few movies better captured the value of finding some measure of comfort in the art one loves than Terence Davies’ beautiful, intimate, bracingly honest Emily Dickinson biography, A Quiet Passion. No 2017 film better conveyed life as an avalanche of joy and woe, never entirely free of strife yet never completely bereft of humor and happiness; as an alternatingly sweet and gutting rush. A swift, sometimes frightening current that sweeps us along, in which we simply do our best to cling to what is beautiful and heartening. In telling the simple story of one poet’s life, Davies’ film deftly evokes the full emotional gamut of being, while delivering two of the year’s most luminous and subtle performances and serving up one of the year’s most deliciously eloquent screenplays. A Quiet Passion emerges as the rare biographical film that shakes off the dust of history, crackles with real energy, and seamlessly attunes itself to the lifeforce of its subject. A Quiet Passion opens with a terrific scene that concisely and memorably captures the gently defiant soul of its great American poet subject. The year is 1848 and it is the last day of the second semester at the Mount Holyoke Female Seminary. A terse, sharp headmistress is giving a closing lecture on Christianity to a room full of adolescent women. She demands that any girl who wants to come to the Lord and find salvation move to the right side of the room. Then she instructs all the girls who hope attain Christian salvation one day to step over to the left side of the room. When all the feet have stopped shuffling, only one young woman is left standing in the center of the hall: a self-possessed, coolly confident redhead of eighteen years of age named Emily. The seminary instructor scowls at this immovable object of a girl and curls her lip in disgust. She reprimands her for her impertinence and then asks her, “Are you in the Ark of Safety?” Emily calmly and bluntly replies, “I fear that I am not.” The Emily Dickinson we meet and come to know is indefatigably resistant to a society intent on foisting its dogmas and mores upon her, particularly those of the Christian church. On this day in 1848, Emily is taking her leave of Mount Holyoke and waiting for her family to whisk her back to the warmth of their family home in Amherst, Massachusetts. Her rescue party consists of her warm, slightly domineering attorney father, Edward (Keith Carradine, very good), her eldest brother Austin (played in youth by Benjamin Wainwright and as an adult by Duncan Duff), and her demurely good-humored little sister Vinnie (Rose Williams in youth, and as an adult by the great Jennifer Ehle, in a performance of beautiful subtlety and compassion). Before returning to Amherst, the Dickinsons make a stop in Boston to pick up their Aunt Elizabeth, a devoutly religious older woman with an excitably conservative temperament. The Dickinson children seem to delight in making Aunt Elizabeth clutch her pearls. As the family agnostic, Emily feels a particular duty to stand firm in the face of Aunt Elizabeth’s pious judgment. While Emily is a proud free-thinker, however, we also gather that she is not challenging her aunt merely for the sake of puckish provocation. There is an unspoken sense that she sees an intellectual foil in this family member. Emily is a young woman who thinks often of death and despairs of the knowledge that she will one day lose people close to her; even this fussy, prickly aunt whose beliefs are so very different from her own. Before Aunt Elizabeth leaves the family, likely for the last time, Emily earnestly gushes, “I hope you live for a hundred years!” Aunt Elizabeth looks flummoxed. “What a repellent idea!,” she gasps. “I am not afraid to die, Emily, and neither should you be.” In the next scene, the Dickinson family poses to have their photographs taken and we watch their faces rapidly age on camera. Some fifteen years hurtle by in an instant. A Quiet Passion is the story of a woman who, even at a tender age, felt there was precious little time. She was a brilliant poet, a witty iconoclast, and also a fairly modest, self-effacing woman. Emily Dickinson quietly defied the traditional values of her time, but she also cherished the small comforts of a life spent at home. She would live all her days within the walls of the family house in Amherst until her death from kidney disease at the age of fifty-five. Outside of the deaths of the Dickinson parents and the sudden, rude interruption of the Civil War, A Quiet Passion is not a film of seismic plot developments, which is rather the point. It is about the Emily Dickinson and itthe people who formed the main cast of her uneventful but spirited life. Chief among those characters is Vryling Buffham, a frank, sardonic woman with a knack for tartly skewering the antiquated social norms and arbitrary fender rules her New England peers so cautiously tiptoe around. This makes her a fast friend to Emily. A Quiet Passion is about being an independent thinker and a woman during America’s first century, and how one woman’s intelligence, morbidity and scintillating wit made that experience more vibrant while also making the repressiveness harder to stomach. Terence Davies’ film is a beautiful, rich, and witty character study, and it is also in many ways a phenomenally sad one. It is the story of a woman who lived a seemingly slight existence, but it carries a mighty undertow of feeling. A Quiet Passion throbs with the full emotional spectrum of life. It visits a very mannered time and place and finds a messy cornucopia of colors there. It is a biography and a period piece that digs under the surfaces of its genres to find deep truth, lovely human connection, and sharp humor. The biographical picture is a notoriously tricky genre to pull off with any real artfulness. Too often, even truly skilled directors get sucked into the trap of being rotely informative to the point where they neglect to evoke the true spirit of their subject. One of the great modern examples of how to get at a biographical subject’s essence is Todd Haynes’ 2007 Bob Dylan biopic, I’m Not There, which portrays the famously enigmatic and opaque Dylan as five different characters with different names, one played by Cate Blanchett. That highly stylized, subjective approach was well-suited to an elusive self-stylist like Bob Dylan. What impresses me about Terence Davies’ work on A Quiet Passion is that Emily Dickinson is a significantly less flashy figure. Davies and his brilliant leading performer have taken on the challenge of capturing a dazzling mind that lay humbly in the package of a modest, self-critical woman; an assertive woman, but one with little outward vanity. This was a person whose renown as a poet would not arrive until decades after her death. A Quiet Passion is an astonishingly assured portrait of Emily Dickinson as a woman of unfussy, unadorned integrity, and rendering that kind of person in a way that feels cinematic is about as difficult a feat as I can imagine. Davies makes his highly verbal film just as visually distinct as it needs to be. The memorable images are subtle but strikingly effective. He establishes young Emily as a fearless guardian of her principles by introducing her as the lone figure facing down a room full of authoritarian zealots. A beautiful circular pan around the Dickinson’s dimly lit family room, containing every member of the family, wordlessly captures how much Emily treasures her loved ones and how overcome she is by the ache that she will one day lose them. A haunting sequence shows the older, reclusive Emily sitting alone in her dark bedroom as a dapper male silhouette ascends the stairs. This man that she patiently waits for could be the elusive, noble man who could love her and still respect her agency. It could be the God she has doubted throughout her life at last revealing Himself and easing her mortal fears. Or it could be Death, the phantom figure that constantly occupied her thoughts and became one of the great muses of her poetry. Of the three suitors, the third was the only one she was certain would one day visit her. A Quiet Passion is a film whose time, place, and subject matter promise poise and restraint. But while this is often a very restrained film, it is remarkable how completely alive it is, from its lovely, fallible characters to its expressive dialogue. Rather than feeling suffocating, the traditional period setting only makes Emily Dickinson and those in her orbit feel even more vibrant in contrast. That said, while I deeply admire how visually dynamic A Quiet Passion is, the film is certainly most satisfying as a decadent smorgasbord of words. The dialogue in the film is insightful, poignant, acerbic, funny, and sometimes devastating. As he did with 2016’s Sunset Song, Terence Davies has made a film that feels both lushly cinematic and utterly literary. Emily Dickinson found solace from the heartache of her short, spartan life in the written word: poetry, rigorous philosophical discussion, and spirited games of sparkling wordplay. Some of my favorite moments in cinema this year were just watching Emily and Vryling Buffham trade quips and droll observations about religion, art, and society, as Vinnie listened with a bemused smile, delighted to watch the game and uncertain if she should jump in. As an aside, I could honestly write a full paragraph or more on how much I love the characterization of Emily’s winningly smart, quietly supportive, and ineffably sympathetic little sister. As a thing of pure writerly beauty, A Quiet Passion is unquestionably one of 2017’s great scripts. It is both biting and graciously humane. In sum, it possesses that quality that Emily Dickinson herself strove for throughout her life: spirited, unflinching honesty. Emily Dickinson was a poet with a voracious appetite for language, a love of the world’s beauty, and an unshakable fixation with her own mortality. She saw the world in lovely, rich hues, but she also saw those hues fading away into oblivion before her eyes. In its snippets of poetry, its dryly sophisticated banter, and its heart-rending, masterfully acted scenes of sorrow and loss, Terrence Davies has bottled the pure essence of what I feel when I read an Emily Dickinson poem. The feeling of a soul too taken with the vivacity of life to be classified as simply morbid, yet too conscious of life’s impermanence not to glimpse it in the background of the sunniest day. A Quiet Passion is a film as lovely, invigorating, and briskly chilling as a gust of New England wind. It takes what could have been a stuffy biography and infuses it with so much depth and bruising emotion that it becomes impossible to think of it in the same ossified category as films like Gandhi or Ray. This is no Emily Dickinson biopic, but a visual poem about the power and limitation of words. Their ability to shine a light into the darkness of existence and their powerlessness to repel death. A Quiet Passion is a rumination on life as something wonderful, heady, painful, and brief, dedicated to a literary talent who saw the world in all those lights. I am by no means an Emily Dickinson scholar, but there is a subtle, soft-spoken kind of dynamism to A Quiet Passion that feels utterly in keeping with the works of hers that I have read. It is a film with an appetite for life and a feeling of hushed awe for death. The sense one gets from the film and Nixon’s staggeringly great performance is of a woman who had a lot of uncertainty about what waits after death, but who felt it was more important to hold true to her own moral and intellectual compass than to betray it out of fear for her soul. Her defiance was not so much a denial of that fear as it was a resolve to endure in the face of it. This is a film about defiance as a beautiful act of self-expression. The film itself is not trying to prove or disprove the existence of God or resolve any other grand cosmic questions. It is simply a salute to a woman who felt she had no answers to such questions and refused to be coerced into avowing what she did not know. 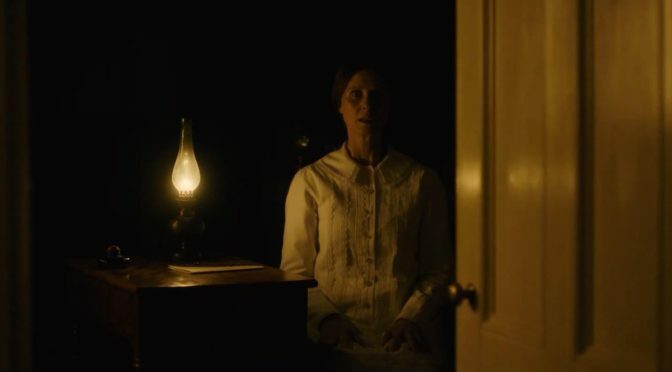 A Quiet Passion has a deep admiration for Emily Dickinson as a woman who felt it was right to guard a private space in your mind and soul, and to stand firm in that place. Whatever we believe is part of the wonderful freedom given to us as human beings, and the only sure wrong choice we can make is to not decide for ourselves. When Emily resists kneeling in Christian fealty, her father sternly admonishes her, “Your soul is no trivial matter.” Emily responds, “I agree. That is why I am so meticulous in guarding its independence.” The Emily Dickinson of this film is a stubborn soul, but her defiance is not snide or petulant. It is the humble, thoughtful steadiness of a spirit that hopes to be moved, but refuses to be pushed. A Quiet Passion is a tender, clear-eyed love letter to a graciously unyielding kind of rebel. It is an alternatingly warm and unsparing portrait of an artist who faced the slings and arrows of sexism and theological dogma and, with scarcely a hint of acrimony, would not cede ground to them. This is a beautiful reminder that, while society needs its fiery iconoclasts and brazen punks, rebellion can also be a quiet and personal act. Firebrands come in many shape and sizes and A Quiet Passion shows us a great American firebrand whose flame was no less incendiary for burning surely and steadily. The glorious smile of flickering in Cynthia Nixon’s eyes as her Emily prepares to once again eloquently defend the battlements of her spirit is simply a marvelous, inspiring thing to watch for any free-thinker. With due respect to Mildred Hayes’ fine, profanity-laden tirades in Three Billboards Outside Ebbing, Missouri, I consider Emily Dickinson to be the bold, uncompromising heroine that 2017 deserves. While Emily Dickinson found her solace in poetry, I left the film feeling that she also found it within herself. Or perhaps finding solace in a piece of art is fundamentally the same thing as locating it in your own soul. We can take in a poem or a book or a film and have it resonate with us, but I think that resonance only occurs once we have internalized those words or images, repeating them within ourselves. A Quiet Passion is about facing down a sometimes harsh world and doing what you can to take sustenance from what is around you; pulling from the best parts of life and using those bits of beauty and humor and maybe even sadness to stoke a fire within yourself. And I think the film is also about the limits of solace. Emily Dickinson lived a very modest life. She found no romantic companionship. She met with the derision of those who found her too eccentric, too crassly forward, or lacking in the submissive demureness expected of women in her time. She listened on as condescending voices dismiss the great women writers of the day as maudlin or gloomy. She watched works of genius be waved away with the tired, sexist cliche that female authors were too stridently emotional. She died at an early age with precious few works published and no sign of recognition from the world around her. She waited for some hint of the posterity she deserved, but the unaccountable cur never came calling. She would not live to see her own vindication. And all of that hardship and pain and downright unfairness cannot be simply washed clean by solace; by saying that Emily found some beauty in the world as if that could somehow undo the strife she weathered. It puts me in a familiar, conflicted place as a self-professed optimist. It feels cheap to pretend like solace amounts to much in the grand scheme. But it also feels cynical to say that it means nothing. And I think that might be the place where A Quiet Passion intends to leave the viewer. Life is a brief and overwhelming cacophony of love, anger, joy, loss, and woe. If it all feels a little arbitrary, confusing and cruel sometimes, I guess that’s because it is. It’s lovely and rapturous too, for whatever that is worth. And if it seems hard to reconcile the poles of happiness and hardship, maybe it is because they are not meant to be reconciled. A Quiet Passion is about a great mind who fretted over the unanswerable questions of life, created beautiful art out of the ambiguity surrounding death, and probably left just as mytified as when she came in. For my part, I do not know what solace is really worth when weighed against the inscrutable enormity of it all. But I do hope each and every one of you finds as much of it as you could need, in whatever form you find it. For the time being.